Firstly I will like to say "Thanks" to Indian Railways for thinking about Disabled / differently abled person and developing a customized coach understanding the requirements of disabled person and attaching one disable coach in almost all running trains. This has been a welcome step for disabled / differently abled people because most general compartments these days hardly have place to sit and it is certainly a big problem for disabled people in traveling in general coaches. But all that glitter's isn't Gold. Indian railways certainly did a great job but missed a big deal regarding the position of disabled coach. Currently it has been positioned just behind the Engine or the last coach in most trains. This inherently means that disabled coach comes too far from main railway entrance. Many trains are quite good in lengths and there are many stations which have small platforms. In such trains like 19116 Bhuj Bandra Sayaji Nagri Express these coaches comes too far from railway station entrances. And in stations with small platforms like Kosamba (R.S), Surat these coaches even don't come on platforms. They are positioned too far. Even for a normal passenger it's difficult to enter the train without a platform. Now imagine the pain a disabled / differently abled fellow has to take when entering in disabled coach from such station. Firstly he has to travel almost some 200 meters to reach the place where he can expect the train. Even if Wheel Chairs are provided its still tough to reach there because of stone laded railway tracks and even if they reach entering into trains without platforms is hard. At times disabled people are unable to reach to the coaches and they have to travel in general coaches because of improper position of coaches and general coaches are generally overloaded. Also Railways need to ensure that most people are aware of the availability of Wheel chair services for disabled / differently abled person. Pics says much more then words. 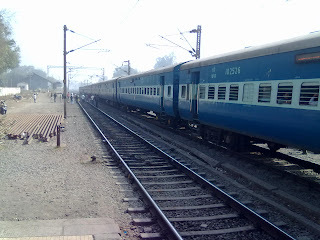 So here i am attaching some images taken by me at Kosamba Railway Station, Surat. 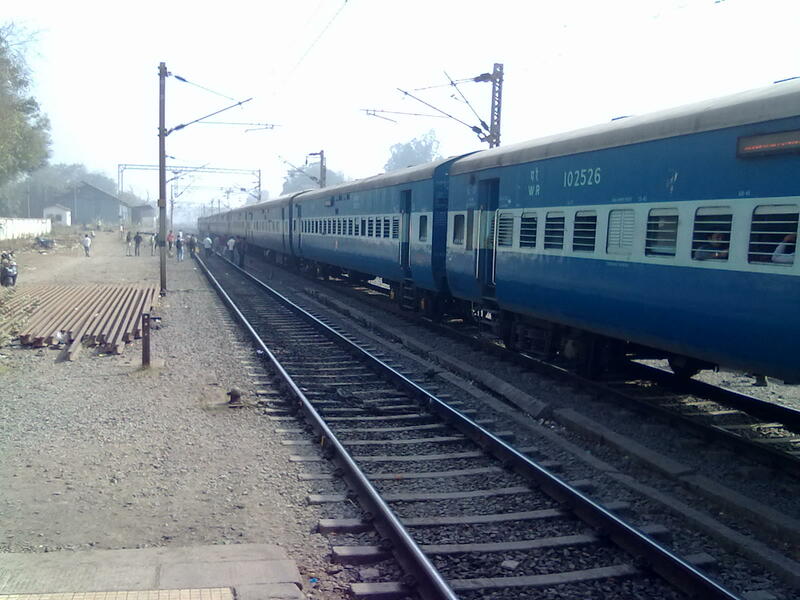 Sayaji Nagri Express standing at Kosamba Railway Station can't find platform at both ends. As per last weeks incident a lady somewhere in 50's was pulling a lady almost in late 70's. It appeared like she had disability in legs, she was literally being ragged on platform by the other lady in-order to take her to the coach. She could not take her to disable coach being so far positioned. I was coming out of the general coach and found the old lady in miserable condition. I asked her "why you are pulling her like this?" the lady screamed "she has problem in legs, and I wish to take her along with me". I moved my hands for the help to get her inside the train.. I asked why you did not took the wheel chairs from station...! she was shocked hearing that she could have taken the wheel chairs; and gave blank look, she added son i was not aware about it...! Somehow me along with a friend helped both the ladies to enter the overcrowded general train coach. 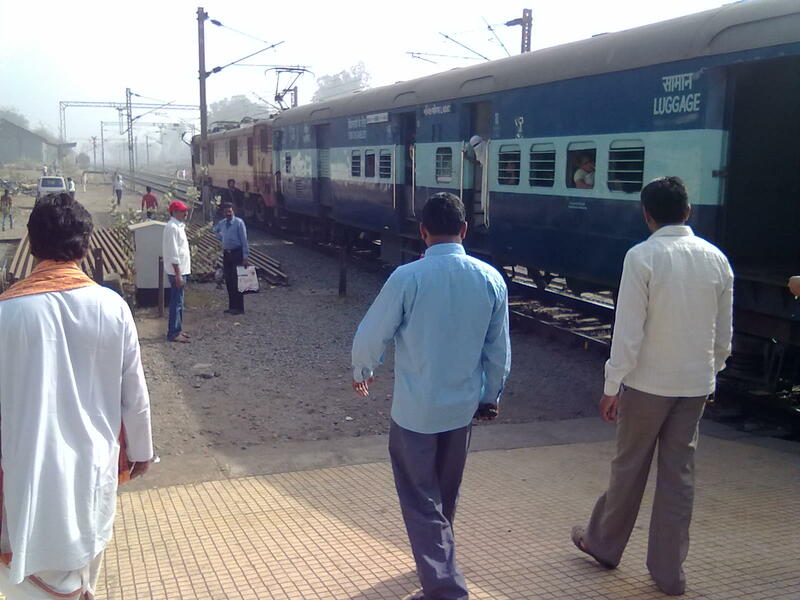 This incident took place at Kosamba Railway Station (PIN 394120) in Train Bandra - Bhuj Sayaji Nagri Express. Railways take care of business class people by placing AC coaches at center, but I think they can travel a few steps more in order to accommodate disabled coach in center. Railways must do this to the soonest possible. Everyday many disabled people face such instances. And we must also raise voices so that railways takes the necessary action. Lets express our concerns that we are ready to walk few steps additional but please do put the disabled coach somewhere at center. I have filed a written complaint to Railways for this serious concerns but its been a month to hear from them. Please do take some time to write to the railways so that they can hear it.